Fr. Georges Naidenoff, SJ, biographer of the life of Ven. Pauline-Marie Jaricot, personally encouraged me greatly to continue to increase the spread of the missionary work of the Living Rosary throughout the world. This work is made possible by a very unique non-profit organization, with its headquarters in Dickinson, Texas, USA. We began on December 8, 1986 with THIRTY local people and, today we number nearly 12 million members – representing every continent in the world. 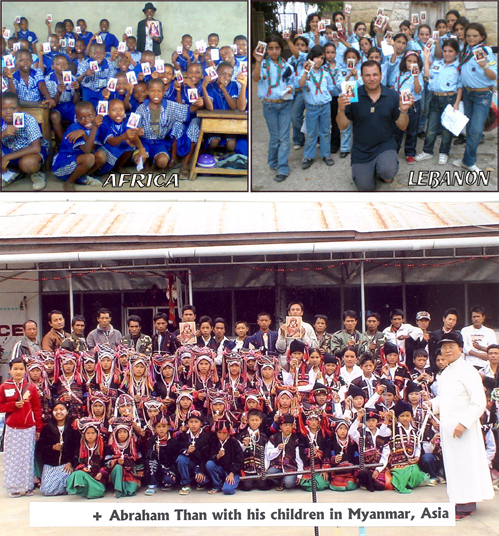 Last year, over $600,000.00 went into our missionary efforts. The generous and compassionate outreach of the ULRA members, such as yourself, is evidenced by the volume of encouraging letters of testimonies pouring into our office every day. Our ULRA is founded on solid faith in God’s Love for the entire world and for each and every human being in it. Let us increase and multiply our SACRIFICES in the coming year. May God’s blessings be upon us and our benefactors! May our prayers and Decades form the bulwark of the Church and our Family during the grave times which lie directly ahead! Zeal for the Salvation of Souls! O Mary, conceived without sin, pray for us who have recourse to thee and for those who do not have recourse to thee, especially for the enemies of Holy Mother the Church! His name is “LEGION” and always he is changing his label and face but his indelible sign remains the same: hatred of the Church, hatred of the just and hatred of the Immaculate Mother of God. The Holy Ghost is the active Principle of sanctification. The Church is the earthly manifestation of the Holy Ghost, its Living Soul. The Spirit animates the Body which is the Church. The graces by which we are elevated to supernatural life are wrought by the Sacraments which are the external signs of the action of the Holy Ghost. No power can quench its Life, and no force can prevent its living growth. Baptized into His Body and animated by His Grace, we are bound up in Him. How happy are we to bear our Paraclete within us, and how sacred the heart where He dwells! He that rejects Him shall find no comfort. He who grieves Him shall be eternally lost. 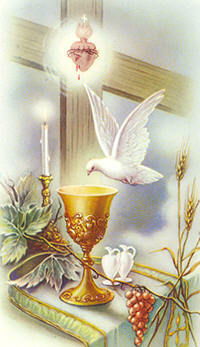 The Holy Ghost is the principle of the life of the Church and, therefore, the source of Her unity. Thus, disunion from this Life is a contradiction and results in death. Let us grasp that the terrible war which is raging universally is a battle against the Holy Ghost! The Immaculate is so closely united with the Holy Ghost that she is called His spouse. She is the personification of the Holy Ghost! It is impossible to separate the Holy Ghost from Mary the Immaculate, since she is the instrument He uses in all He does in the order of grace. Clearly this raging battle is most surely a war against the Immaculate Mother of God! It is a full attack on Truth, Unity, and Love Itself! Arrogant and well-disciplined by an inhuman mystique, the enemy applies methodically, point-by-point, his plan of extermination. The greatest crime of this enemy is that it succeeds in the perversion of virtues of Christianity. Only Saints can resist this poison. How often do we not return hate for hate towards these ruthless criminals and butchers! We even justify our hatred towards them. When slapped on the right cheek, instead of turning the left, we return the slap with a resounding blow. Even if we gained a temporal victory, the enemy has succeeded in infecting us with his deadly virus. To live in an atmosphere of hatred and not be contaminated by that hate is as miraculous as raising the dead to life. Try to realize that, in Mary, there is a magnificent palace built of gold and precious stones, worthy of the great King Who dwells there; and try to realize what is true: that you are contributing toward His splendor and glory by honoring His permanent dwelling place, which is the Immaculate Heart of Mary! Through obedience, Mary was espoused by the Holy Ghost. By Mary’s Immaculate Conception, an implacable enmity arose between her and the devil; thus, she was able to intimately join in her Son’s mortal struggle against Satan, sin and death. Mary shares completely in both the victory of Jesus Christ and in the royal power won by right of conquest. From Christ, and through her, all grace comes to us. Delegate of the Infinite Mercy, she is the crucible in which all our dross is consumed by the flame of sacrificial love, and made into a worthy offering of purest gold. As Mother of Christ the Head, she is Mother of the Mystical Body. Spouse of the Holy Ghost, she receives only to give, and takes only to transform. There is only one obstacle destructive of her redemptory action – our voluntary refusal of it. All that matters is to surrender to her sanctifying action and to be a ready instrument in her radiant hands. She is the Immaculate, the direct way to Christ, the weapon of conquest with which to establish the reign of Jesus Christ universally, from one end of the earth to the other! Nothing must sorrow the Holy Ghost quite as much as the mediocrity of souls avowed to the Blessed Mother. Let us sacrifice our lives a thousand times to sanctify them. There is not one single heroic act that we cannot accomplish with the help of the Immaculate! We live in a time of great penance. Let us know how to profit by it. Suffering is good and sweet to him who accepts it willingly. How eternally efficacious for the salvation of souls is this surrender of our wills to the Will of God! The evil is very great and time grows short! Why have we not known how to save IN TIME the golden grain of truth stolen by the “Father of Lies”! It is all so simple. We must belong entirely to the Immaculate Heart of Mary, absolutely and unconditionally. Our sanctification is her mission. Let us conquer for Christ all souls in the entire world to the end of time … through the Immaculate Heart of Mary. CONSECRATE YOURSELF voluntarily and completely to Mary Immaculate in order to belong to her entirely. Wear the Brown Scapular as your breast plate and shield. Wear the Miraculous Medal, and pray daily the Holy Rosary which will be the source of your strength, inspiration and love. LABOR FOR THE CONVERSION OF SINNERS, heretics, schismatics, infidels, communists and all enemies of Holy Mother the Church. Strive to induce others to join the Militia of the Immaculate Heart of Mary. Preach the Holy Rosary, teach others the value of the Brown Scapular, embrace and obey the Commandments of God, fulfilling perfectly the duties of your state in life. BE A GREAT SAINT and instrument in the hands of Mary through perfect submission of your will to the Will of God, through the Immaculate Heart of Mary. Be solicitous for the glory and honor of your Immaculate Mother. The Principle Dogmas of our Faith are from Mary, in Mary, with Mary and through Mary. Looking at Mary, these Dogmas are read, embraced, loved and believed. She contained and contains the Gospel which She offers to us all through the Mysteries of the Most Holy Rosary! True Christians can be recognized by this sign: LOVE FOR THE MOTHER OF GOD! There is one surpassing good in our lives and that is our precious Catholic Faith, from which all other good radiates. Do we think often about our glorious treasure? Does the thought of it fill us with great joy and thrill our very being? It is so good to come to be with Jesus at the Sacred Altar, to fill our hunger, to pour out our love, to rest at peace in His presence and hear His quiet voice fill our soul with inspirations, consolations and hope. Just think for a moment what life would be without God present on our Altars. What if every sanctuary lamp was found in darkness and all the Tabernacles were emptied of their Treasure? Life would be chilled in our veins. Life would be a cold, dead thing. Jesus would be gone! It is so important to thank Him, to love Him, to visit Him in the Holy Tabernacle, and to keep Him company in our soul as we carry Him with us on our day’s journey. It gives me deepest joy to see your devotion to the Blessed Sacrament and receive your anxious notes to have Masses offered for your loved ones and special intentions. These are all arranged with care and gratitude. 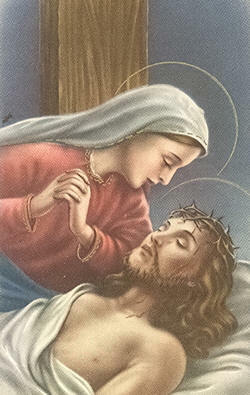 I have prepared a set of 30 days of Holy Masses for all of our members, our benefactors and families, for those who are suffering and for the dying. This is in gratitude for your constant support and making it possible for us in Ukraine to take part in the Living Rosary, print the beautiful Rosary materials which support this devotion, distribute Sacramentals and publish our uplifting VOICE OF THE LIVING ROSARY periodical. Thanks to your love and kindness, we are able to give these away, free of charge, to those who otherwise would never be able to purchase such a lovely gift. We are trying to implant in the children’s hearts the love of God, the glory of the Saints, and the goal of being true Children of Mary, Our Mother, and, this, just in the nick of time, as the plague of materialism overtakes the whole world. Let us make haste to enroll everyone in the Militia of the Mother of God where their efforts will be crowned with Triumph. This is God’s promise to us; it is the solemn promise of the Most Blessed Trinity. We are already in the month of November, the month during which we remember all our reposed and deceased members in a special way. 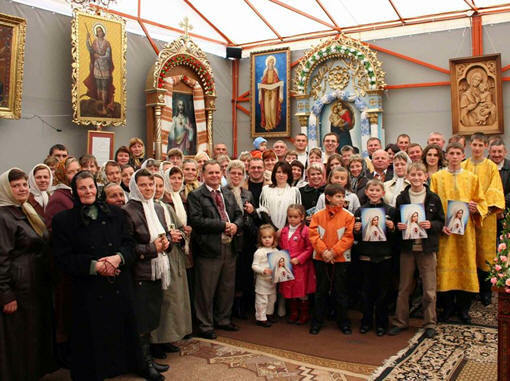 It has been our privilege to offer for all of you the Sacred Thirty Days of Masses for your departed loved ones during November and we have decided to extend these Masses throughout the month of December in gratitude for your constant support and care of the needs of our Living Rosary Family in Ukraine. At the beginning of December, we are going to arrange thirty Sacred Masses for our benefactors, the relatives of our benefactors and everyone who will ask 30 days Masses for the living. We will remember their spiritual and material needs at the Altar. You help us so much and it gives us great joy to be able to make this eternal gift to you. God is Good! Each of us gives freely what he has been given. 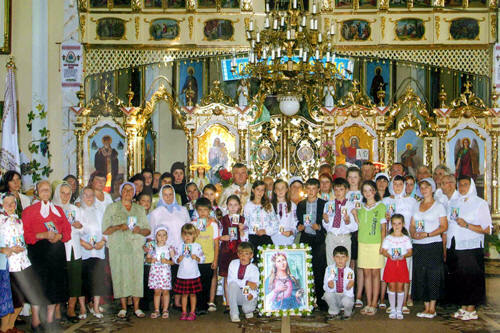 The Living Rosary in Ukraine is publishing 13,000 Rosary booklets which will be distributed free of charge to those who otherwise would be unable to purchase such a lovely booklet. Through it, our people learn the history, prayers and Mysteries of the Holy Rosary. The interest in the Rosary here is growing every day. It is a simple and effective prayer, but still there are many here who do not know it. Your help gives us the ability to introduce and teach this devotion. God love you! In Ukraine, there is a beautiful custom for the Feast of St. Nicholas. Special gifts are placed under the children’s pillows. St. Nicholas was a bishop of the Catholic Church, who was always helping the children and the poor. Our children love this feast and try to be very obedient and diligent in order to receive the gifts of St. Nicholas. We are publishing a letter from St. Nicholas which touches the hearts of the children to focus on God and not the gifts. This is a time to prepare our hearts for the coming of the Divine Infant King. All these projects are possible because of your generosity, charity and sacrifice. We are keenly aware of this and hold you up in prayer! May God reward you abundantly! and Ruler of All His Possessions! In the Old Testament, we see partial fulfillment of this prophecy. Jael, a woman, saved the Israelites by crushing the head of the enemy General. In doing this, she crushed the head of a serpent. Later, we read about Judith who saved the people of Israel when she cut off the head of another enemy General. The enemy Generals were real people that existed, but they prefigured Satan, his minions, and the enemies of the Church. These women of the Old Testament prefigured Mary’s role in Christ’s Church today. We often see pictures and statues depicting these words of Scripture. At first glance, Our Lady of Guadalupe does not appear to be crushing the head of a serpent, but is standing on a crescent moon. This crescent moon is the symbol of Islam, which is perhaps the greatest heresy ever invented by the Serpent. Mary crushed the serpents that the Aztecs worshipped and who demanded the blood sacrifice of hundreds of thousands of human hearts. Without one word, Our Lady of Guadalupe brought them to the worship of the true God in the single most amazing conversion story in history. 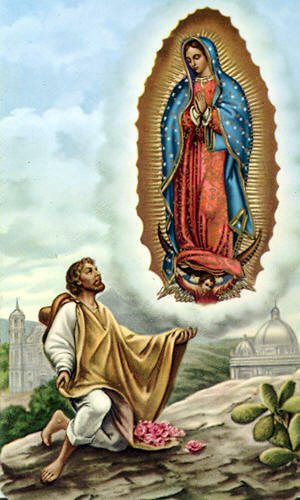 Juan Diego conveyed the message of the lady to the bishop who then prudently insisted that the lady give him a sign that this message came from Heaven. This, he did and Mary promised that a sign would be given the next day. That night, Juan’s uncle became gravely ill. In the morning, Juan took a different route to the church, so as to avoid the lady, and quickly bring a priest to his uncle for the Last Sacraments. The beautiful lady was waiting for him, assured him that his uncle was healed, and told him to go on top of Tepeyac Hill and gather the flowers there. Juan knew that no flower had ever bloomed on top of that hill, yet he obeyed her. There, he saw clusters of Castilian roses. He gathered them into his cloak and carried them to the lady who arranged them with her own hands. Juan went right to the bishop. When he opened his cloak, the roses fell to the floor and all who gazed at the cloak fell to their knees. On his tilma was painted in vivid color a beautiful young lady. Juan’s uncle was cured and the bishop built the church on Tepeyac Hill. The Aztec writing was not composed of alphabets but pictures; it was a pictograph. The picture on the cloak of Juan Diego was painted by the Hand of God. Our Lady is surrounded by the rays of the sun but she obliterates the sun itself. This told the Indians that the lady was more powerful than the sun – OUT WITH THE SUN GOD! The symbol of their stone god was the crescent moon. In the pictogram, Our Lady was standing on a burned out crescent moon – OUT WITH THE STONE GOD! With these two gods defeated, there was no longer any need for human sacrifice. The Indians were freed of the terrible tyranny of human sacrifice. At the hem of the lady’s garment was an angel who seemed to carry her through space. Thus, they knew she was not of this earth. Stars are powerful and yet she used 46 stars for ornaments on her robes. The blue-green color of her gown belonged to divinity. The borders of her robe were trimmed in the finest gold, and fur lined her collar and sleeves, signifying royalty. Who was she? She was not God, for her hands were folded and her head was bowed to one who was greater than she, one who was her God. She wore the Black Cross they had seen on the banners of Cortez and the Cross of the missionaries. She was wearing the Cross of Christ. 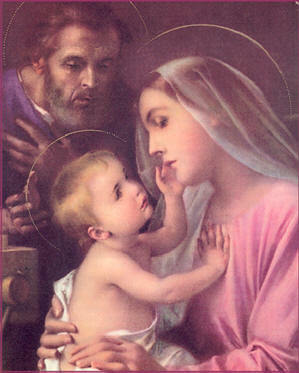 They understood the message and, by the millions, they embraced the ever-virgin Mary. In seven years, 8 million Indians from twelve different Nations converted to Catholicism. In a simple way, without one word, the Mother of Christ had crushed the 2,000 year tyranny of the stone serpent and brought an empire of souls into the Mystical Body of her Divine Son. What Mary did then, she can do now, if we will be the littlest of her children and obey her. We kneel before Mary as David knelt before the Ark. He worshipped God dwelling in the Ark and not the Ark itself. Mary is the dwelling place of God and God wants to be worshipped in His holiest temple. Mary possesses perfectly all the virtues of the Beatitudes, for it is no longer she who lives, but God living and reigning in her where He has set up his throne. Oh, earth, tremble before this holy place! Let the sea and all within it thunder praise! All the trees of the world shout for joy! Make way for the Mother of God! When Mary’s children pray their Hail Mary’s well and gaze upon the Sacred Mysteries, her Immaculate Heart leaps with joy. We do not have to worry about winning the love of Mary, because she first loved us! Her love for us is a love without conditions, because we are her sons and daughters. “Woman, behold thy son! Son, behold thy Mother!” When we finally grasp Mary’s love for us, it will bring joy to our hearts amidst the times of greatest misery in our lives. The most inhuman and sorrowful thing in our world today is the cruelty of mothers who kill the infants in their womb. The heart of a mother LOVES! God made it so! In spite of the ingratitude, hate and total failure of the life of a child, a mother never stops loving that child. Hers is an unconditional love placed there by the Hand of God. The fawn and calf depend entirely upon their mother’s care and milk. They remain at their mother’s side at all times depending on her for everything! 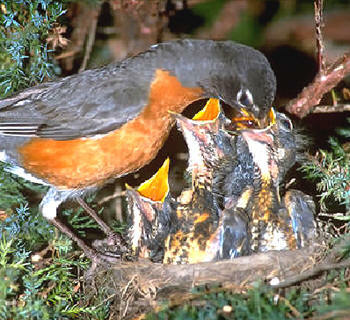 The mother robin prepares the nest, sits on the eggs, brings the chicks into the world, feeds them, protects them and teaches them how to fly. If the chick falls out of the nest, he will die. Like the baby chick, if we are totally dependent on Mary, we will one day spread our wings and fly to the heights of Heaven. Nothing is so precious and necessary as a mother. The male grizzly bear stalks the female when she is with cub and waits for the moment she is not near, so that he might devour her offspring. If the cub stays close to his mother, he has nothing to fear. We have only to look at nature to see that survival demands a Mother!!! 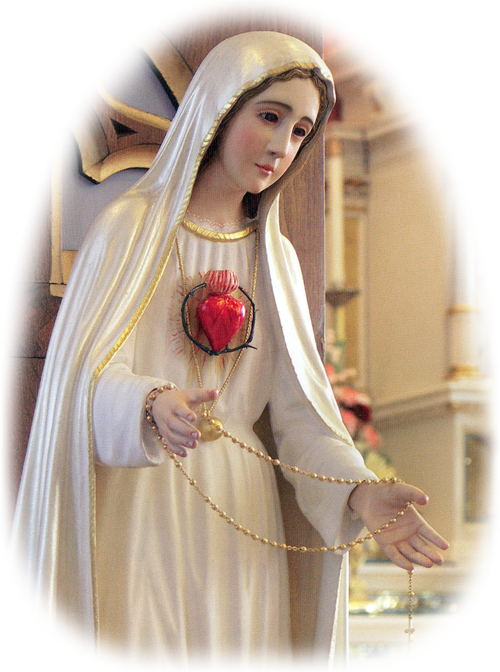 At Fatima, God let us know that He will save the world only through devotion to His Mother’s Heart. It is a Mother’s intercession that prevents the world today from being destroyed by the just wrath of God. It was beneath the Heart of a Mother that the Body of Christ, the Church, and our redemption, began. 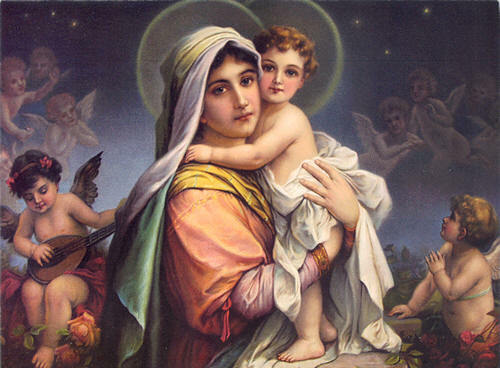 It was the bosom of a Mother who nourished the Word Incarnate. We receive all graces through a Mother’s hands. Everything good in the world comes to us through a Mother. We refer to Our King as Jesus of Nazareth, but to be more precise, He is Jesus of Mary! He made her Queen of His household and has given her charge over all His possessions. He gives her victory in the most impossible battles, grants her conversion of the most hardened hearts, and the most wretched sinners. She alone is given all that she requests of Him. A child who loves Mary is a child after God’s own heart! A child who loves Mary is the devil’s worst nightmare! The fawn, the calf, the baby robin and the grizzly cub can’t tell us what they think of their mother, but God gave us the Hail Mary as the best way for us to tell our Mother that we love her. Some lovers play their favorite record or sing ballads to their beloved. We know which song has power over the heart of our Mother, and it will always be the greatest hit sung by the angels and saints in Heaven for all eternity. Never does it fail to give Mary unspeakable joy. The Hail Mary reverberates throughout the vaults of Heaven giving Glory to God in the Highest! May every individual, every family, every parish and every diocese make the consecration to Mary’s Immaculate Heart! Then and only then will the consecration of the world be complete; only then, will selfishness, hatred, impurity and injustice be no more; only then will Mary be Queen and Christ King: Only then, will God’s Truth, Justice, Charity and Peace reign among all mankind. Let not the fire that burned in the Heart of Pauline die out. As a disciple of Christ, Pauline united the two most powerful weapons to conquer the Heart of God and that of man: self-sacrifice and charity without measure, without end! We who are her children must go forward with the work of Mary’s Heart, the very Heart of God, that the Most Precious Blood of Christ may be poured out upon the whole world daily through our Dedicated Decade and apostolic action. Our prayers united throughout the universe, will mobilize men into full missionary labor. Let us LOVE WITHOUT LIMIT, WITHOUT END!!! Remember that you belong exclusively, unconditionally, absolutely and irrevocably to the Immaculata. Whoever you are, whatever you have, and whatever you can do and endure belong to the Immaculata. May She transform them all into Christ! You are an instrument in her hands! YOU Are THE MATCH Who Keeps THE FIRE Burning Brightly! You are currently browsing the Universal Living Rosary Association of Saint Philomena (ULRA) blog archives for November, 2010.